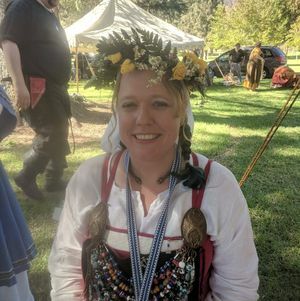 Her Majesty Staeina currently serves as Queen of Caid, at the side of King Adam Makandro. TRM were crowned at Winter Coronation/12th Night January 5, 2019 in the Barony of Lyondemere. Her Majesty particularly enjoys Viking-style embroidery. Staeina Halfdanardottir is currently working on a Challenge piece given to her by Baron Giuseppe Francesco da Borgia. 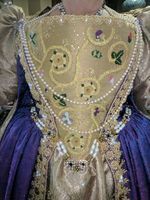 Hand embroidered Elizabethian Stomacher. Gold thread (Plaited Braid and Chain Stitch), Silk threads (Detatched Buttonhole). Spangles, rhinestones, pearls, crystals, and sequins. The design is based on examples from the Elizabethian era. Elements were designed with Duchess Bridget Lucia Mackenzie in mind. There is a hidden Mickey, as well as roses, caterpiller, strawberry and strawberry leaves. Hand embroidered Russian "Dogs" for His Majesty Sir Athanaric Thaurismunths sunus: Patches for heraldic cloak; split stitch; cotton thread on linen, attached to wool cloak. 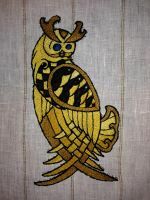 Hand embroidered Viking inspired Owl for Her Majesty Sigriðr in irska: Patch for Viking apron; split stitch; cotton thread on linen, attached to a linen apron. The design is inspired by her heraldry of a Gold owl with black herman spots. Largess for the Barony of Calafia; split stitch embroidery. 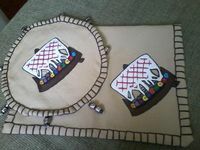 Cup cover and Napkin Raffle Prize for CPrize 2012; split stitch embroidery. Commission piece for Mistress Cristal Fleur de la Mer: Device patch for Laurel Cope; split stitch and stem stitch; wool thread on linen fabric. 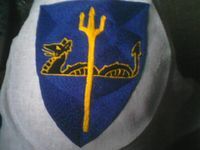 Gyldenholt Baronial Arms – worn on Baronial Unarmored Champion Regalia; split stitch; cotton thread on linen. Gift to Baron Giuseppe Francesco da Borgia: given at Apprenticing; Cotton thread on linen. 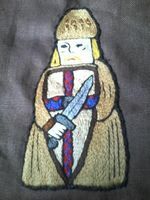 Embroidered Chess Piece - worn on son's parti style tunic; split stitch; cotton thread on linen. 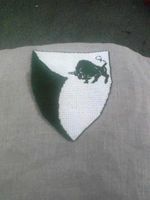 Embroidered piece for THLady Rekon of Saaremaa - worn on tunic; split stitch; cotton thread on linen. 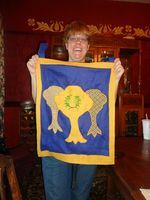 Pelican for Mistress Baroness Ceridwen Killian - worn on Pelican cloak; spilt stitch; wool thread on linen. 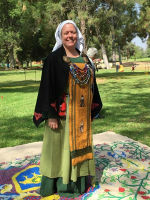 Handfasting apron piece - worn by Lady Merewen of Warthwic; Split stitch and Stem Stitch; cotton thread on linen. 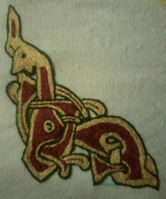 Viking inspired hand embroidered fillet. Stem stitch; metallic pearl cotton, pearl cotton on linen. Viking inspired hand embroidered wall hanging. 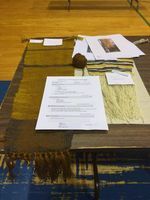 Linen, Silk, and Wool on linen. Split stitch and stem stitch. 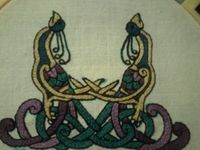 Inspired from the Overhogsdahl and Oseberg Tapestries. Received special recognition for Journeyman Embroidery Team Gyldenholt (Pentathlon 2015). cross stitched belt favor worn by Lord Jakob Hálfdanarson - cotton thread on linen. Appliqued Trees with hand stitched leaf decoration. 1 or 3 that I made for the Barony of Gyldenholt. 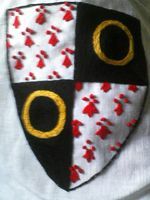 Hand embroidered device to be placed on hoods for Baron/Baroness of Naevehjem. Cotton thread on linen. Split stitch. 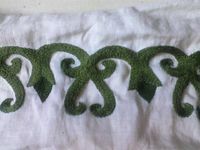 Hand embroidered device to be placed on hoods for Baron/Baroness of Lyondomere (Jon Tom and Eva). Cotton thread on linen. Split stitch. 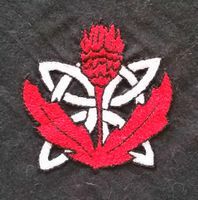 Hand embroidered Celtic knot thistle. Wool thread on wool. Split stitch - Viking age hood. 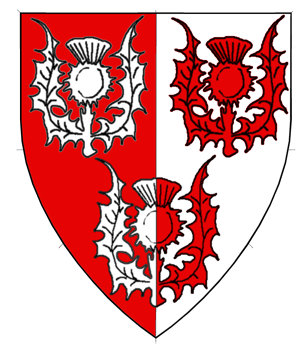 My Heraldic colors and thistle. 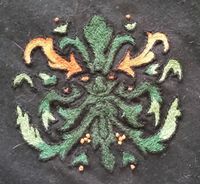 Hand embroidered greenman for THL Adam Makandro. Wool thread on wool. Split stitch - Viking age hood. 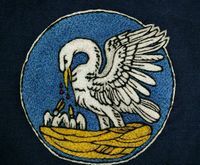 Hand embroidered Pelican for Mistress Baroness Ceara ingen Chonaill - Cotton thread on Linen. Split stitch. 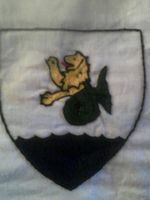 Hand embroidered Viking Bears for Baron Ursul Ursul Vladislavl' pravnuk - Wool thread on Wool. Split Stitch. 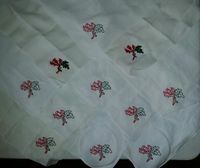 Hand embroidered handkerchiefs. These were given out to the consorts during Crown Tourney. 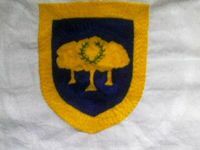 The design is a thistle and oak leaf to represent Sir Adam and myself. It is cotton thread on linen (for easy care). Split stitch. Tudor Gown; linen underdress, brocade gown, hand embroidered cuff. Cuff; hand spun wool on linen. Green Scottish dress, Black underskirt, white chemise with hand embroidered cuffs. 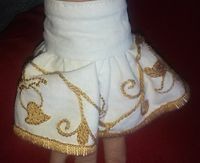 Cuffs are embroidered with silk thread on white linen. Bodice is finished with pewter viking dragon lacers. Thank you to Lady Dametta Sweet and Baroness Ceara ingen Chonaill for assisting me with sewing and patterning. 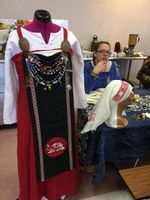 Viking Apron with hand embroidered Viking Chess Pieces. Black Wool Cape with Silk embroidery. Split Stitch. Wool, Silk, Silk tread, Linen, Cotton thread. Viking Apron piece with Jellings style Rondell. 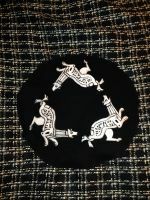 Split Stitch, satin stitch. Cotton thread on Linen. 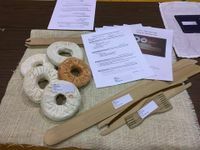 Caid Pentathlon 2017 - 1st Place Apprentice: How To Paper, 1st Place Apprentice: Weaving: Other, 1st Place Apprentice: Tools: Fibre Arts, 2nd Place Apprentice: How To Paper, 2nd Place Apprentice: Tools: Fibre Arts. 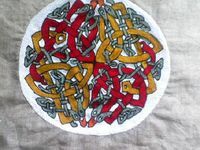 Griffen Design on son's Viking Feldr; split stitich; cotton thread on linen. Hand Woven items made on a Viking Warp Weighted Loom. Entry was made using hand dyed hand spun wool. Viking era Warp weighted loom. Started playing in July 2011.